For data diodes, see Unidirectional network. For other uses, see Diodes (disambiguation). Structure of a vacuum tube diode. The filament itself may be the cathode, or more commonly (as shown here) used to heat a separate metal tube which serves as the cathode. The most common function of a diode is to allow an electric current to pass in one direction (called the diode's forward direction), while blocking it in the opposite direction (the reverse direction). As such, the diode can be viewed as an electronic version of a check valve. This unidirectional behavior is called rectification, and is used to convert alternating current (ac) to direct current (dc). Forms of rectifiers, diodes can be used for such tasks as extracting modulation from radio signals in radio receivers. However, diodes can have more complicated behavior than this simple on–off action, because of their nonlinear current-voltage characteristics. Semiconductor diodes begin conducting electricity only if a certain threshold voltage or cut-in voltage is present in the forward direction (a state in which the diode is said to be forward-biased). The voltage drop across a forward-biased diode varies only a little with the current, and is a function of temperature; this effect can be used as a temperature sensor or as a voltage reference. Also, diodes' high resistance to current flowing in the reverse direction suddenly drops to a low resistance when the reverse voltage across the diode reaches a value called the breakdown voltage. Diodes, both vacuum and semiconductor, can be used as shot-noise generators. Thermionic (vacuum-tube) diodes and solid-state (semiconductor) diodes were developed separately, at approximately the same time, in the early 1900s, as radio receiver detectors. Until the 1950s, vacuum diodes were used more frequently in radios because the early point-contact semiconductor diodes were less stable. In addition, most receiving sets had vacuum tubes for amplification that could easily have the thermionic diodes included in the tube (for example the 12SQ7 double diode triode), and vacuum-tube rectifiers and gas-filled rectifiers were capable of handling some high-voltage/high-current rectification tasks better than the semiconductor diodes (such as selenium rectifiers) that were available at that time. In 1873, Frederick Guthrie observed that a grounded, white hot metal ball brought in close proximity to an electroscope would discharge a positively charged electroscope, but not a negatively charged electroscope. In 1880, Thomas Edison observed unidirectional current between heated and unheated elements in a bulb, later called Edison effect, and was granted a patent on application of the phenomenon for use in a dc voltmeter. About 20 years later, John Ambrose Fleming (scientific adviser to the Marconi Company and former Edison employee) realized that the Edison effect could be used as a radio detector. Fleming patented the first true thermionic diode, the Fleming valve, in Britain on November 16, 1904 (followed by U.S. Patent 803,684 in November 1905). Throughout the vacuum tube era, valve diodes were used in almost all electronics such as radios, televisions, sound systems and instrumentation. They slowly lost market share beginning in the late 1940s due to selenium rectifier technology and then to semiconductor diodes during the 1960s. Today they are still used in a few high power applications where their ability to withstand transient voltages and their robustness gives them an advantage over semiconductor devices, and in musical instrument and audiophile applications. In 1874, German scientist Karl Ferdinand Braun discovered the "unilateral conduction" across a contact between a metal and a mineral. Indian scientist Jagadish Chandra Bose was the first to use a crystal for detecting radio waves in 1894. The crystal detector was developed into a practical device for wireless telegraphy by Greenleaf Whittier Pickard, who invented a silicon crystal detector in 1903 and received a patent for it on November 20, 1906. Other experimenters tried a variety of other minerals as detectors. Semiconductor principles were unknown to the developers of these early rectifiers. During the 1930s understanding of physics advanced and in the mid 1930s researchers at Bell Telephone Laboratories recognized the potential of the crystal detector for application in microwave technology. Researchers at Bell Labs, Western Electric, MIT, Purdue and in the UK intensively developed point-contact diodes (crystal rectifiers or crystal diodes) during World War II for application in radar. After World War II, AT&T used these in their microwave towers that criss-crossed the United States, and many radar sets use them even in the 21st century. In 1946, Sylvania began offering the 1N34 crystal diode. During the early 1950s, junction diodes were developed. At the time of their invention, asymmetrical conduction devices were known as rectifiers. In 1919, the year tetrodes were invented, William Henry Eccles coined the term diode from the Greek roots di (from δί), meaning 'two', and ode (from ὁδός), meaning 'path'. The word diode, however, as well as triode, tetrode, pentode, hexode, were already in use as terms of multiplex telegraphy. Although all diodes rectify, the term rectifier is usually applied to diodes intended for power supply application in order to differentiate them from diodes intended for small signal circuits. The symbol for an indirectly heated vacuum tube diode. From top to bottom, the element names are: plate, cathode, and heater. A thermionic diode is a thermionic-valve device consisting of a sealed, evacuated glass or metal envelope containing two electrodes: a cathode and a plate. The cathode is either indirectly heated or directly heated. If indirect heating is employed, a heater is included in the envelope. In operation, the cathode is heated to red heat (800–1000 °C). A directly heated cathode is made of tungsten wire and is heated by current passed through it from an external voltage source. An indirectly heated cathode is heated by infrared radiation from a nearby heater that is formed of Nichrome wire and supplied with current provided by an external voltage source. The operating temperature of the cathode causes it to release electrons into the vacuum, a process called thermionic emission. The cathode is coated with oxides of alkaline earth metals, such as barium and strontium oxides. These have a low work function, meaning that they more readily emit electrons than would the uncoated cathode. The plate, not being heated, does not emit electrons; but is able to absorb them. The alternating voltage to be rectified is applied between the cathode and the plate. When the plate voltage is positive with respect to the cathode, the plate electrostatically attracts the electrons from the cathode, so a current of electrons flows through the tube from cathode to plate. When the plate voltage is negative with respect to the cathode, no electrons are emitted by the plate, so no current can pass from the plate to the cathode. Point-contact diodes were developed starting in the 1930s, out of the early crystal detector technology, and are now generally used in the 3 to 30 gigahertz range. Point-contact diodes use a small diameter metal wire in contact with a semiconductor crystal, and are of either non-welded contact type or welded contact type. Non-welded contact construction utilizes the Schottky barrier principle. The metal side is the pointed end of a small diameter wire that is in contact with the semiconductor crystal. In the welded contact type, a small P region is formed in the otherwise N type crystal around the metal point during manufacture by momentarily passing a relatively large current through the device. Point contact diodes generally exhibit lower capacitance, higher forward resistance and greater reverse leakage than junction diodes. A p–n junction diode is made of a crystal of semiconductor, usually silicon, but germanium and gallium arsenide are also used. Impurities are added to it to create a region on one side that contains negative charge carriers (electrons), called an n-type semiconductor, and a region on the other side that contains positive charge carriers (holes), called a p-type semiconductor. When the n-type and p-type materials are attached together, a momentary flow of electrons occur from the n to the p side resulting in a third region between the two where no charge carriers are present. This region is called the depletion region because there are no charge carriers (neither electrons nor holes) in it. The diode's terminals are attached to the n-type and p-type regions. The boundary between these two regions, called a p–n junction, is where the action of the diode takes place. When a sufficiently higher electrical potential is applied to the P side (the anode) than to the N side (the cathode), it allows electrons to flow through the depletion region from the N-type side to the P-type side. The junction does not allow the flow of electrons in the opposite direction when the potential is applied in reverse, creating, in a sense, an electrical check valve. However, if the polarity of the external voltage opposes the built-in potential, recombination can once again proceed, resulting in a substantial electric current through the p–n junction (i.e. substantial numbers of electrons and holes recombine at the junction). For silicon diodes, the built-in potential is approximately 0.7 V (0.3 V for germanium and 0.2 V for Schottky). Thus, if an external voltage greater than and opposite to the built-in voltage is applied, a current will flow and the diode is said to be "turned on" as it has been given an external forward bias. The diode is commonly said to have a forward "threshold" voltage, above which it conducts and below which conduction stops. However, this is only an approximation as the forward characteristic is smooth (see I-V graph above). For a bias less than the PIV, the reverse current is very small. For a normal P–N rectifier diode, the reverse current through the device in the micro-ampere (µA) range is very low. However, this is temperature dependent, and at sufficiently high temperatures, a substantial amount of reverse current can be observed (mA or more). There is also a tiny surface leakage current caused by electrons simply going around the diode as though it were an imperfect insulator. In a small silicon diode operating at its rated currents, the voltage drop is about 0.6 to 0.7 volts. The value is different for other diode types—Schottky diodes can be rated as low as 0.2 V, germanium diodes 0.25 to 0.3 V, and red or blue light-emitting diodes (LEDs) can have values of 1.4 V and 4.0 V respectively. as mentioned in the previous section. Normal (p–n) diodes, which operate as described above, are usually made of doped silicon or germanium. Before the development of silicon power rectifier diodes, cuprous oxide and later selenium was used. Their low efficiency required a much higher forward voltage to be applied (typically 1.4 to 1.7 V per "cell", with multiple cells stacked so as to increase the peak inverse voltage rating for application in high voltage rectifiers), and required a large heat sink (often an extension of the diode's metal substrate), much larger than the later silicon diode of the same current ratings would require. The vast majority of all diodes are the p–n diodes found in CMOS integrated circuits, which include two diodes per pin and many other internal diodes. These are point-contact diodes. The 1N21 series and others are used in mixer and detector applications in radar and microwave receivers. The 1N34A is another example of a crystal diode. In a diode formed from a direct band-gap semiconductor, such as gallium arsenide, charge carriers that cross the junction emit photons when they recombine with the majority carrier on the other side. Depending on the material, wavelengths (or colors) from the infrared to the near ultraviolet may be produced. The first LEDs were red and yellow, and higher-frequency diodes have been developed over time. All LEDs produce incoherent, narrow-spectrum light; "white" LEDs are actually a blue LED with a yellow scintillator coating, or combinations of three LEDs of a different color. LEDs can also be used as low-efficiency photodiodes in signal applications. An LED may be paired with a photodiode or phototransistor in the same package, to form an opto-isolator. The symbol used to represent a particular type of diode in a circuit diagram conveys the general electrical function to the reader. There are alternative symbols for some types of diodes, though the differences are minor. The triangle in the symbols points to the forward direction, i.e. in the direction of conventional current flow. Typical diode packages in same alignment as diode symbol. Thin bar depicts the cathode. A simple envelope demodulator circuit. The first use for the diode was the demodulation of amplitude modulated (AM) radio broadcasts. The history of this discovery is treated in depth in the radio article. In summary, an AM signal consists of alternating positive and negative peaks of a radio carrier wave, whose amplitude or envelope is proportional to the original audio signal. The diode rectifies the AM radio frequency signal, leaving only the positive peaks of the carrier wave. The audio is then extracted from the rectified carrier wave using a simple filter and fed into an audio amplifier or transducer, which generates sound waves. In microwave and millimeter wave technology, beginning in the 1930s, researchers improved and miniaturized the crystal detector. Point contact diodes (crystal diodes) and Schottky diodes are used in radar, microwave and millimeter wave detectors. Rectifiers are constructed from diodes, where they are used to convert alternating current (ac) electricity into direct current (dc). Automotive alternators are a common example, where the diode, which rectifies the AC into dc, provides better performance than the commutator or earlier, dynamo. Similarly, diodes are also used in Cockcroft–Walton voltage multipliers to convert ac into higher ac voltages. A diode can be used as a temperature measuring device, since the forward voltage drop across the diode depends on temperature, as in a silicon bandgap temperature sensor. From the Shockley ideal diode equation given above, it might appear that the voltage has a positive temperature coefficient (at a constant current), but usually the variation of the reverse saturation current term is more significant than the variation in the thermal voltage term. Most diodes therefore have a negative temperature coefficient, typically −2 mV/˚C for silicon diodes. The temperature coefficient is approximately constant for temperatures above about 20 kelvin. Some graphs are given for 1N400x series, and CY7 cryogenic temperature sensor. ^ Tooley, Mike (2013). Electronic Circuits: Fundamentals and Applications, 3rd Ed. Routledge. p. 81. ISBN 1-136-40731-6. ^ Lowe, Doug (2013). "Electronics Components: Diodes". Electronics All-In-One Desk Reference For Dummies. John Wiley & Sons. Retrieved January 4, 2013. ^ Crecraft, David; Stephen Gergely (2002). Analog Electronics: Circuits, Systems and Signal Processing. Butterworth-Heinemann. p. 110. ISBN 0-7506-5095-8. ^ Horowitz, Paul; Winfield Hill (1989). The Art of Electronics, 2nd Ed. London: Cambridge University Press. p. 44. ISBN 0-521-37095-7. ^ "Physical Explanation – General Semiconductors". 2010-05-25. Retrieved 2010-08-06. ^ "The Constituents of Semiconductor Components". 2010-05-25. Archived from the original on 2011-07-10. Retrieved 2010-08-06. ^ a b c Turner, L. W. (2013). Electronics Engineer's Reference Book, 4th Ed. Butterworth-Heinemann. pp. 8.14–8.22. ISBN 1483161277. ^ Guarnieri, M. (2011). "Trailblazers in Solid-State Electronics". IEEE Ind. Electron. M. 5 (4): 46–47. doi:10.1109/MIE.2011.943016. ^ Guthrie, Frederick (October 1873) "On a relation between heat and static electricity," The London, Edinburgh, and Dublin Philosophical Magazine and Journal of Science, 4th series, 46 : 257–266. ^ Redhead, P. A. (1998-05-01). "The birth of electronics: Thermionic emission and vacuum". Journal of Vacuum Science & Technology A: Vacuum, Surfaces, and Films. 16 (3): 1394. doi:10.1116/1.581157. ISSN 0734-2101. ^ "Road to the Transistor". Jmargolin.com. Retrieved 2008-09-22. ^ Braun, Ferdinand (1874) "Ueber die Stromleitung durch Schwefelmetalle" (On current conduction in metal sulphides), Annalen der Physik und Chemie, 153 : 556–563. ^ Sarkar, Tapan K. (2006). History of wireless. USA: John Wiley and Sons. pp. 94, 291–308. ISBN 0-471-71814-9. ^ a b SemiGen Inc.
^ a b Advanced Semiconductor, Inc.
^ a b Giacoletto, Lawrence Joseph (1977). Electronics Designers' Handbook. New York: McGraw-Hill. p. 24-138. ^ Elhami Khorasani, A.; Griswold, M.; Alford, T. L. (2014). "Gate-Controlled Reverse Recovery for Characterization of LDMOS Body Diode". IEEE Electron Device Letters. 35 (11): 1079. Bibcode:2014IEDL...35.1079E. doi:10.1109/LED.2014.2353301. ^ Current regulator diodes. Digikey.com (2009-05-27). Retrieved 2013-12-19. ^ Jonscher, A. K. (1961). "The physics of the tunnel diode". British Journal of Applied Physics. 12 (12): 654. Bibcode:1961BJAP...12..654J. doi:10.1088/0508-3443/12/12/304. ^ Dowdey, J. E.; Travis, C. M. (1964). "An Analysis of Steady-State Nuclear Radiation Damage of Tunnel Diodes". IEEE Transactions on Nuclear Science. 11 (5): 55. Bibcode:1964ITNS...11...55D. doi:10.1109/TNS2.1964.4315475. ^ Classification of components. Digikey.com (2009-05-27). Retrieved 2013-12-19. ^ "Component Construction". 2010-05-25. Retrieved 2010-08-06. ^ Component Construction. Digikey.com (2009-05-27). Retrieved 2013-12-19. ^ "Physics and Technology". 2010-05-25. Retrieved 2010-08-06. ^ Fast Recovery Epitaxial Diodes (FRED) Characteristics – Applications – Examples. (PDF). Retrieved 2013-12-19. ^ Protecting Low Current Loads in Harsh Electrical Environments. Digikey.com (2009-05-27). Retrieved 2013-12-19. ^ "About JEDEC". Jedec.org. Retrieved 2008-09-22. ^ "Introduction dates of common transistors and diodes?". EDAboard.com. 2010-06-10. Archived from the original on October 11, 2007. Retrieved 2010-08-06. ^ I.D.E.A. "Transistor Museum Construction Projects Point Contact Germanium Western Electric Vintage Historic Semiconductors Photos Alloy Junction Oral History". Semiconductormuseum.com. Retrieved 2008-09-22. ^ "1N400x Diode Family Forward Voltage". cliftonlaboratories.com. Archived from the original on 2013-05-24. Retrieved 2013-12-19. ^ John Ambrose Fleming (1919). The Principles of Electric Wave Telegraphy and Telephony. London: Longmans, Green. p. 550. 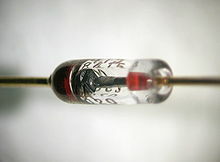 Wikimedia Commons has media related to Diodes.